While most U.S. consumers eat some seafood, the amounts are inadequate to meet federal dietary guidelines, according to studies conducted by U.S. Department of Agriculture (USDA) scientists. Both fish and shellfish, referred to as "seafood," are nutrient-rich protein foods, and consumption has been associated with reduced heart disease risk. Seafood contains healthful natural compounds known as "omega-3 fatty acids." 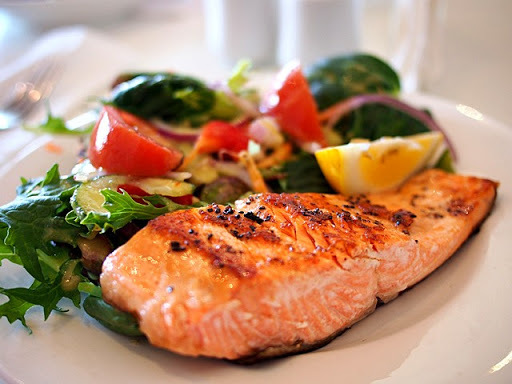 The Dietary Guidelines for Americans, 2010, recommends eating two servings of seafood (about 8 ounces) weekly to get at least 1,750 milligrams of two omega-3s known as EPA (eicosapentaenoic acid) and DHA (docosahexaenoic acid) weekly. Agricultural Research Service (ARS) nutritionist Lisa Jahns led a study with colleagues based on an evaluation of food-intake data collected from a representative sampling of the U.S. population. The data were collected during the national survey known as "What We Eat in America/NHANES." Overall, about 80 to 90 percent of U.S. consumers did not meet their seafood recommendations. Jahns is with the ARS Grand Forks Human Nutrition Research Center (GFHNRC) in Grand Forks, North Dakota. Additionally, a review of published studies that explored fish consumption's link to heart health pointed to consistent evidence supporting a reduced risk of heart disease due particularly to eating oily fish. The review was led by GFHNRC nutritionist Susan Raatz. EPA and DHA are abundant in oily fish such as salmon, mackerel, herring, sardines, anchovies, trout and tuna.